If your avocados aren’t quite ripe enough to use, store them at room temperature. You can speed up the process by putting them into a brown paper bag – the addition of an apple will hurry things along further! Squeeze a little lime juice over the avocado to prevent it from discolouring. Place some red onion, vine cherry tomatoes, radish and cucumber into a bowl and gently combine ingredients with your hands. Drizzle with a little olive oil and season with some salt & pepper. Spoon the salad into the avocado. To make the salsa, place the coriander, shallot, red wine vinegar and chilli into a bowl and squeeze the lime juice over the ingredients. Season with a little salt & pepper. 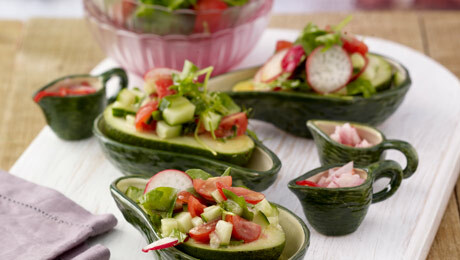 Spoon a large spoonful of salsa over the avocado salad and serve with some crusty bread.